On January 6, Commodore Oliver Hazard Perry received a Congressional Gold Medal for his service at the Battle of Lake Erie. 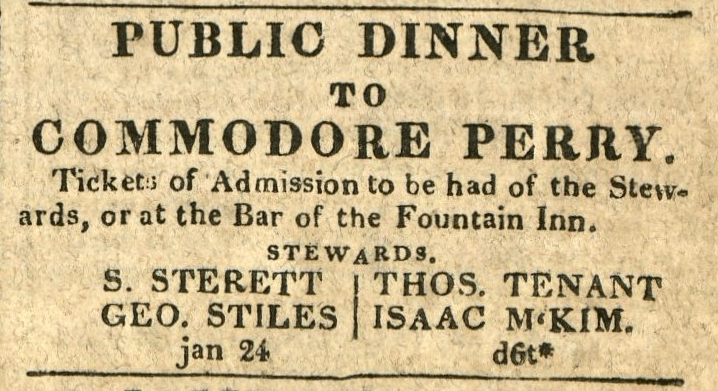 Make sure to sign up for our email newsletter to get more updates on Perry’s celebratory visit to Baltimore at the end of the January 1814. Joseph Sterett (1773-1821) was a wealthy land-owner, merchant and planter who commanded the Fifth Regiment of Maryland militia at the Battle of Bladensburg and Battle of North Point. Thomas Tenant (1769–1836 was a Federalist, a Baltimore merchant, shipowner, wharf owner, and prize agent who served as a major in the Sixth Regiment of the Maryland militia. 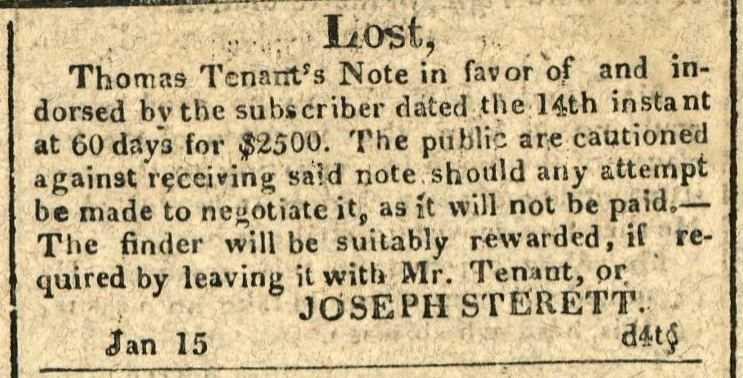 How did Sterett lose a $2500 check from Tenant? Share your theories in the comments!